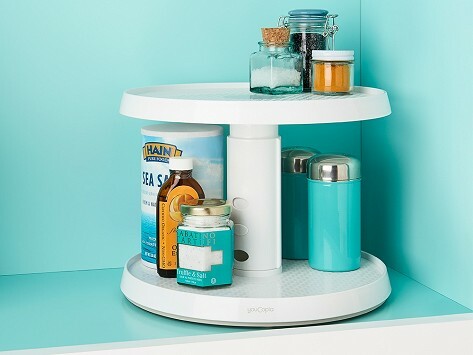 An adjustable two-tier lazy Susan makes better use of kitchen cabinet space and helps keep things tidy. It can fit your space and your stuff, and with two levels of spinning storage, you can see everything as it’s all neatly kept in place. Works like a charm in cleaning up the clutter on the medicine shelf in our pantry. Completely transformed a countertop mess to an organized tidy, convenient and attractive storage spot. The turntable makes it convenient to use the things that you use very often. It is sturdy. It was very easy to put together.